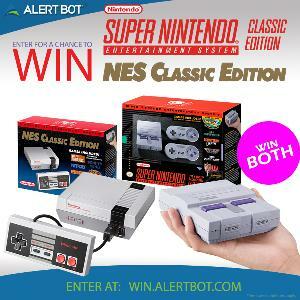 Contest: AlertBot NES Classic and SNES Classic Prize Pack! This contest has been marked as a duplicate of Win an NES Classic and SNES Classic Prize Pack!. AlertBot NES Classic and SNES Classic Prize Pack! Prize: Prizes include a brand new Nintendo NES Classic Edition *and* the new SNES Classic Edition! 51 video games included! What you must do to enter: Use Facebook or Twitter to enter, then unlock more options to win.